In this lesson, we will learn how to calculate the volume of a cylinder and solve associated word problems. 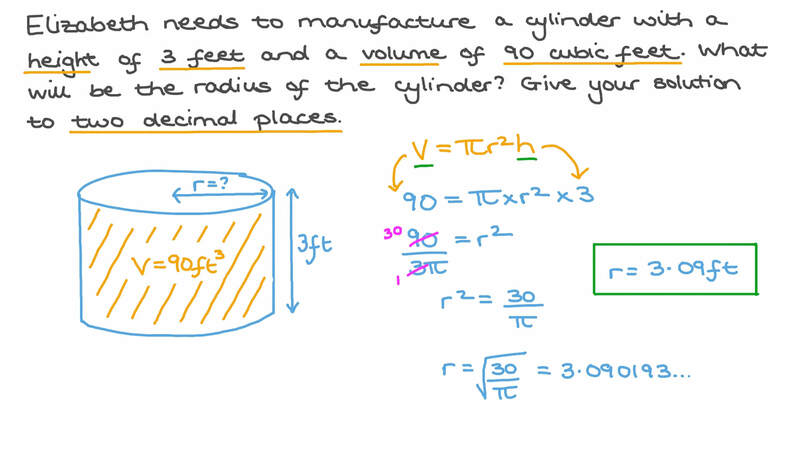 Work out the volume of the cylinder, giving your answer accurate to two decimal places. A cylinder has a volume of 5 4 𝜋 cm3. Given that its height is equal to the radius of its base, find its height. Work out the volume of a cylinder with a radius of 7 and a height of 5. Give your solution to two decimal places. Which has the greater volume, a cube whose edges are 4 cm long or a cylinder with a radius of 3 cm and a height of 8 cm? A tree trunk is 14 feet long and has a circumference of 4 feet. By modeling the trunk as a perfect cylinder, work out the volume of wood in the trunk. Give your answer to two decimal places in cubic feet. Find the volume of the cylinder. Give your answer in in3 to one decimal place. Find the volume of a cylinder whose base has a radius of 14 cm and whose height is 3 cm. Use 𝜋 = 2 2 7 . Mona needs to manufacture a cylinder with a height of 3 feet and a volume of 90 cubic feet. What will be the radius of the cylinder? Give your solution to two decimal places. A cylinder has a height of 19.5 cm. The base of this cylinder has a circumference of 64 cm. Find the volume of the cylinder to the nearest centimetre cubed. Work out the volume of a cylinder with a diameter of 15 inches and a perpendicular height of 5 inches. Give your answer as a fraction, in terms of 𝜋 , in its simplest form. Engy wants to fill up a cylindrical fish tank with water. It has a radius of 7 inches and a height of 14 inches. Work out how much water she will need, in cubic inches, giving your solution to two decimal places if needed. The Density of a material is calculated by dividing its mass by its volume. A particular cylinder has a height of 3 feet, a radius of 2 feet, and a mass of 200 pounds. Calculate the density of the cylinder giving your answer to two decimal places. A right circular cylinder and an oblique circular cylinder have the same radius and height, as seen in the given figure. What does Cavalieri’s principle tell us about the volumes of the two shapes? AThe volume of the right cylinder is greater than that of the oblique cylinder. CThe volume of the oblique cylinder is greater than that of the right cylinder. Work out the volume of the oblique cylinder. Give your answer in terms of 𝜋 . Find the dimensions of the right circular cylinder that is described as follows: the radius and height differ by two metres, the height is greater than the radius, and the volume is cubic meters. Work out the volume of a cylinder with a diameter of 11 and a height of 3.4. Give your solution as a fraction in terms of 𝜋 in its simplest form. A cylindrical paddling pool is 2 feet deep and has a diameter of 8 feet as seen in the given figure. How many cubic feet of water would be needed to completely fill the pool? Give your answer to the nearest cubic foot. Emma is baking cakes. She will make two cakes using a cake tin that has a depth of 4 inches and a diameter of 20 inches. She will cut a circular hole with a diameter of 6 inches from the centre of one of the cakes. The two cakes are modelled in the diagram. She wants to cover the top and sides of Cake A in frosting. What is the total surface area of the cake that will be covered in frosting? Give your answer to the nearest square inch. What is the volume of Cake B? Give your answer to the nearest cubic inch. She wants to cover the top and sides of Cake B in frosting. What is the total surface area of the cake that will be covered in frosting? Give your answer to the nearest square inch. It costs $3.98 to buy frosting to cover 150 square inches of cake. How much money must Emma spend in total to frost both of the cakes? What is the volume of Cake A, to the nearest cubic inch? A cylinder has a diameter of 8 cm and a height of 12 cm. Work out the volume of the cylinder, giving your answer in terms of 𝜋 . Find the dimensions of the right circular cylinder whose radius is 3 metres longer than the height and volume is cubic meters. A cylinder has a radius of 9 cm and a height of 14 cm. Work out the volume of the cylinder, giving your answer in terms of 𝜋 . 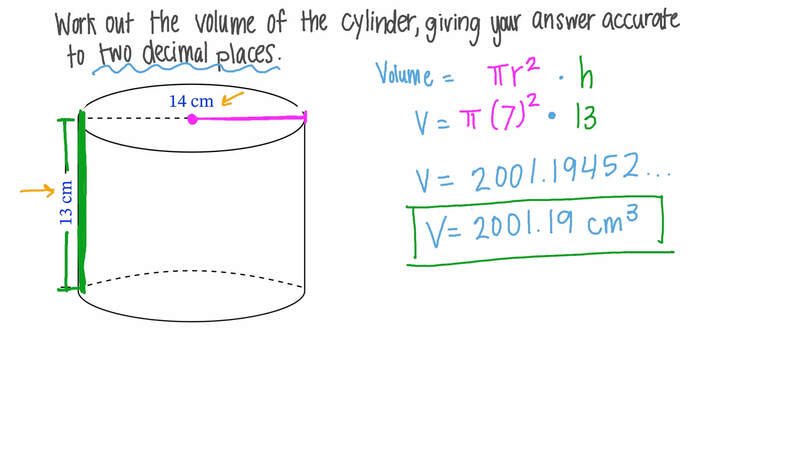 Work out the volume of the half cylinder, giving your answer accurate to two decimal places. A cylindrical tube of sweets has a diameter of 4 cm and a length of 15 cm. 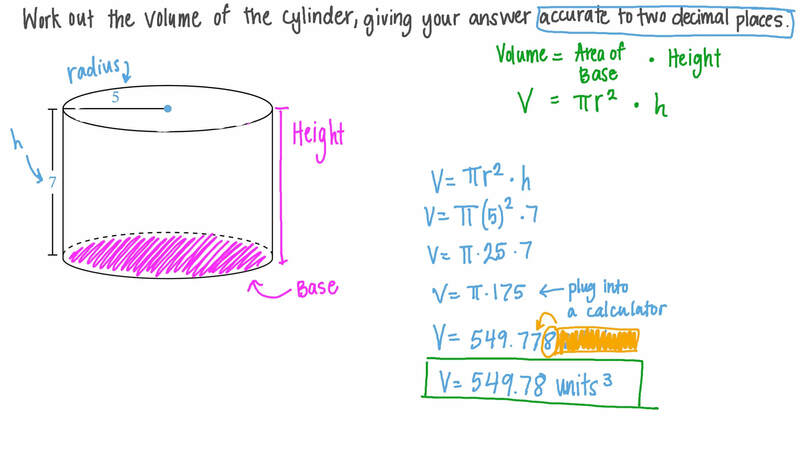 Work out the volume of the tube, giving your answer accurate to two decimal places. A cylinder has a circular base of radius 𝑟 and height ℎ . The cylinder can be dissected into a series of horizontal slices of height 1 which would have volume 𝜋 𝑟 2 . There would then be ℎ layers of these cylinders. What would the total volume of the cylinder be?